Sydney based Ingrid Bass, a former teacher and Principal of a musical theatre academy for children, has taken a side step in her career to launch a sustainable fashion brand. Cantabulous Creations supports a Brazilian fair trade social enterprise that produces gorgeous accessories using recycled materials; drink can tabs to be exact. Cantabulous Creations links with ESCAMA Studio, a fair-trade initiative based in California and Brazil. ESCAMA Studio works with around 60 artisans in underprivileged communities who crochet post-consumer aluminium drink can tabs into fashion statement pieces; belts, bags, guitar straps, jewellery and more. The word ESCAMA means 'fish scales' in Portuguese, and when you see what is produced by the initiative, you will see why. Crocheted cab tabs resemble the metallic scales of a fish. Cantabulous Creations is Australia's representation of the fair trade initiative. 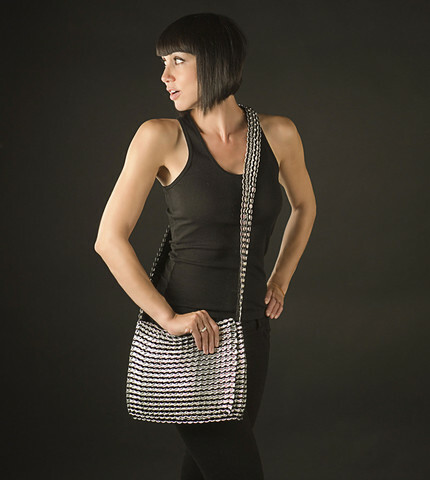 Ingrid Bass started Cantabulous Creations after her sister-in-law gave her a can tab bag. She loved the bag so much, and so did random strangers she met, that she decided to launch her own small business to support the cause. With the launch of Cantabulous Creations, Ingrid hopes to show the people of Australia that it is possible to own beautiful accessories that have a back story. Why? Because the ESCAMA Studio recognises the efforts of each of the artists who create them. 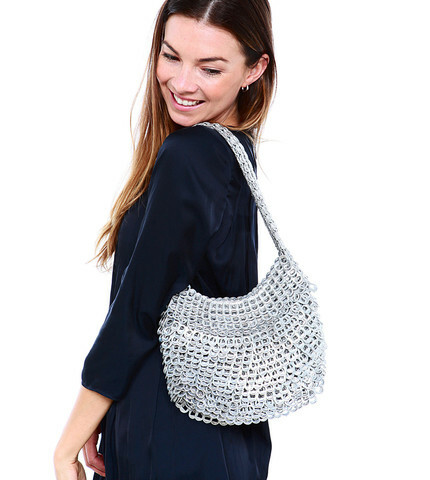 "Cantabulous bags are unique because they are hand-made by Fair-trade artisans in Brazil, created from recycled can-tabs which are crocheted together. Each bag is really a piece of art which comes with a tag bearing the artisan’s signature. Furthermore, purchasers can access information on the artisan and even can communicate with artisan if they like via email. How cool is that?" says Ingrid, the brains behind Cantabulous Creations to Australia. Take a look at the 'who made this' page on the ESCAMA website, and you will see exactly who made your product, and a little history behind their involvement with the enterprise. Ingrid explains that although it is very early to say which Cantabulous Creations product is the most popular, the 'Leda Clutch' won the 2010 Independent Designer Award and happened to be the first piece that first sold out in the range here in Australia. Belts and jewellery are popular, too. That said, it is the 'Greta Bag' that made Ingrid fall in love with ESCAMA products. "I am in love with the Greta bag because it is so comfortable and light to carry and moulds to my body. I also think the design and how the can-tabs fan out like fish scales is really amazing." says Ingrid. When you receive your order, you can even send a little thank you note to the artisans; your message will be translated into Portuguese before being sent on. You will also receive a Reply Paid envelope so you can collect can tabs from drinks. Once you've collected a decent number, simply post back in the mail so they can be sent to Brazil to make more Cantabulous Creations. 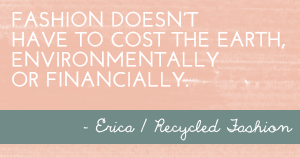 Let the re-cycle live on. Pieces start from $25 for earrings or a bracelet and $30 for a credit card case up to a couple of hundred for large bags. 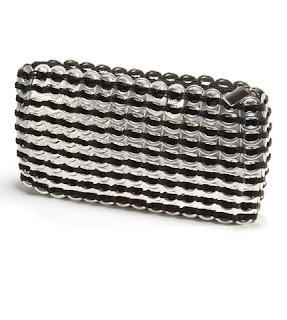 Sign up to Cantabulous Creations e-newsletter online, and you are in for a chance to win a Mini Clutch (Black). Simply complete the online contact form and enter the word 'Clutch' in the comments. Sign up by 29 October 2016 to be in for a chance of winning. Lastly, since the Paralympics in Brazil goes from September 7-18, all orders will receive 10% off during this time. 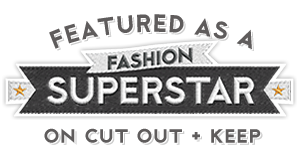 Head to Cantabulous Creations online and treat yourself or your loved ones to a statement piece that gives back to the world, one can tab at a time.